CNN gave some quality airtime Friday to the director of a film on the coming-out story of a lesbian teenage girl. The movie "Pariah" was sponsored by LGBT organizations at the 2011 Sundance film festival and was a featured selection at an international LGBT film festival in Washington, D.C. According to the Human Rights Campaign, the storyline is about 17 year-old teenager Alike who "feels trapped between the straight world, and the butch lesbian scene in Brooklyn. The film chronicles her silent journey to embrace her identity." CNN anchor Fredricka Whitfield apparently thinks some Republican players in the debt ceiling debate are concerned that President Obama is conceding too much. During the 12 p.m. EDT hour Friday, Whitfield alleged that many important players from both parties think Obama may be "caving" to Republicans. "You know, there are a lot of players who are very concerned – Democrats and Republicans who are concerned – and particularly Democrats are concerned that the president may be giving up too much in order to come about a deal," Whitfield remarked while stumbling over her words. America's media for a full week now have been shamefully hyping last Sunday's natural disaster in Joplin, Missouri. WHITFIELD: And so, Dan, the White House thinks this is fairly risk free given that it was a fairly risky move for the president to campaign for Martha Coakley back in the day when she was pushing for the late Ted Kennedy's seat? 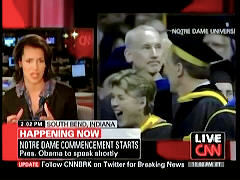 DAN LOTHIAN, CNN WHITE HOUSE CORRESPONDENT: That's right. Risk free in this particular race right now, but you're right. Back in January, when the president made that last minute visit for Martha Coakley, it had been widely viewed she ran a lackluster campaign. The president came at the last minute to help her pull off a win. How risky was it for Barack the Bold to hit the trail for Coakley? A Research 2000 poll taken days before Obama's January 17th appearance had Coakley over Republican Scott Brown by a 49% to 41% margin. Only 14 months earlier, Obama had won Massachusetts with 62% of the vote. The last time Massachusetts voters elected a Republican to the U.S. Senate was 1972. There is something about CNN and the people writing chyrons for the alleged "most trusted name in news" with the "best political team on television." Last week, these geniuses clarified the White House's position on President Barack Obama's religion. 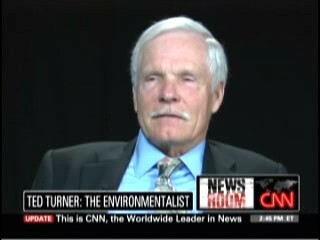 CNN founder Ted Turner said Saturday that if we don't prepare for global warming, we'll be extinct. In a multi-part interview with CNN Newsroom anchor Fredricka Whitfield, Turner spoke about his own devotion and dedication to environmental causes. "Have you altered all your life, all your living so you are what one would call energy responsible?" asked Whitfield. "What we really have is a choice whether we want to do the right things from an energy standpoint or the wrong thing," said Turner. If the media outlets are going to report on tea party events, they're not likely to get any benefit of the doubt much of the time. "Former vice presidential candidate Sarah Palin there in Searchlight, Nev., was the backyard of Senate Majority Leader Harry Reid, but today it's the backdrop of this Tea Party Express - making a stop here," Whitfield said. "Hundreds of people, at least dozens of people - we haven't gotten a count of how many people turned out there. We heard Sarah Palin talk about everything about the campaign, to unseat Sen. Reid to what she calls ObamaCare, on the heels of that health care vote and even talking about her definition of her love of America." Taxpayer tea party activists got their chance earlier to today to speak against CNN during a live television discussion between CNN reporter Lisa Desjardins and anchor Fredricka Whitfield. With chants of "tell the truth," and "Glenn Beck," protesters made known their great displeasure with the former #1 cable network. The Beck taunt, of course, is a reference to the former CNN host turned FNC star. Unlike her former colleague Susan Roesgen who insulted tea party protesters and was confronted on her bias by NewsBusters member "namron", Desjardins didn't dismiss the protesters but instead asked them what they thought of congressman Joe Wilson, famous for his recent outburst that President Obama was lying about his health plan covering illegal immigrants. Estimates for crowd sizes are starting to come in. We're talking at least a million people, folks. CNN's Whitfield on Notre Dame Scandal: Have Catholics 'Evolved' on the Moral Issues? While President Obama was extoling the virtues of wind power in an Earth Day speech, his Justice Department lawyers were attempting to scuttle a lawsuit filed in federal court against Iran by former U.S. embassy hostages. The lawsuit alleges that Iranian President Mahmoud Ahmadinejad was one of the hostage-takers who interrogated the captives. Two days after the story broke on the Associated Press wire, it appears the mainstream media have virtually buried the story, with no televised coverage save for a brief mention on CNN and one story in the Boston Globe. A search for "'lawsuit' and 'Iran'" in Nexis from April 22 to 24 found no mentions of the story on MSNBC nor ABC, CBS and NBC broadcast network news programs. Likewise the Los Angeles Times, New York Times, USA Today, and Washington Post were devoid of stories. A search of "major newspapers" in Nexis did yield one hit, a 380-word AP wire story by Nedra Pickler printed on page A6 of the April 23 Boston Globe. 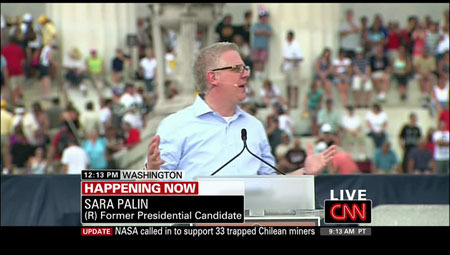 CNN has displayed a double standard in its coverage of the difficulties involving the extended family of Sarah Palin versus that of President Barack Obama. 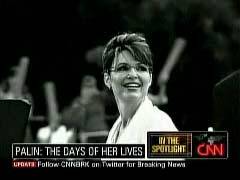 Two programs on the network on Thursday evening used multiple soap opera references to describe recent occurrences in the “Palin family saga.” This contrasts with two incidents involving the aunt and half-brother of the president, which have received minimal coverage from the network.